HTMLToPDFConverter is able to convert multiple html files to PDF files. It is easy to use. The program provides you two options. First, you can select html files in your local computer to be converted to PDF files. A file open dialog is shown. It allows you to select html files from your local computer. You will wait for a while to complete the conversion task. Another option allows you to convert html files on the web to PDF files. You will need to type or paste the address of the html page in to the Address box and click Add to add this address to the conversion list. You can add many html pages as you want. After adding all addresses that you want to the list, click OK and wait a moment until the conversion task finishes. -After the html file is read, it is cleaned. The Jsoup library is used to clean the html file. -The cleaned html file is converted to xhtml file by using the Jtidy library. -The final step is to convert the xhtml file to a PDF file by using XMLWorker library. the program did not create the pdf with images? Now, we still not have a free library that does the perfect thing in html to pdf conversion task. 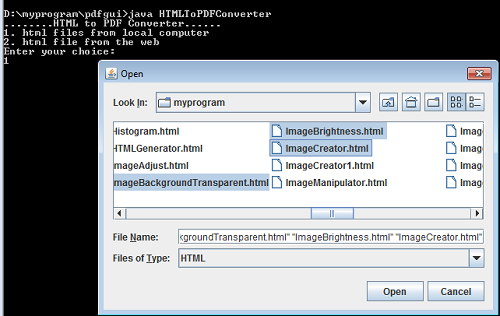 It is useful Java code to convert html to pdf file. I tried to find it for long a go. You can try http://www.tagpdf.com/online/convert-pdf-to-html/ for high quality convert pdf to xhtml online. Even there is 10% discount on the first order. 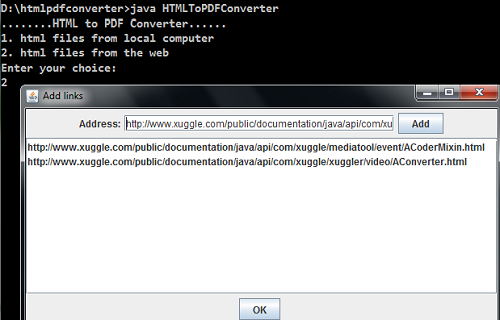 Very informative, Thanks for Sharing, I came across another Java PDF Component that converts PDF files to HTML format. Here is the link, Aspose.Pdf for Java. Could you please tell me how your product is different from this one? This program is able to convert local html files to pdf files and you can also download html files from the internet and convert them to pdf file. Sorry, I am not sure what Aspose can do. I really like your method of converting HTML to PDF. However, at times a need may arise to convert JPG to PDF . For this purpose, i would like to refer to this amazing JPG to PDF converter. You must try this once and experience the smooth operation. Tidy (vers 4th August 2000) Parsing "InputStream"
can u pls help in resolving it? Hey can you tell me how to fix it so it shows images in PDF? can you suggest what to do if HTML contain image your solution is not work for me. there is any solution for that ? let me know. Due to how long Java has been around, almost any question you can imagine has already been asked, answered, indexed, and democratically perfected through upvotes on the Internet. It is seriously hard to stump a search engine with a Java coding problem. One thing you need to remember about spring is that it’s not a single entity. Spring contains various modules like Spring Security, Spring Boot etc. Since Spring is most demanded framework you can find many study materials for it online. Check the below diagram which shows the most popular frameworks used in market.